An 18-year-old male with Lutembacher's syndrome underwent balloon mitral valvotomy (BMV) and device closure of the atrial septal defect (ASD). BMV necessitated technical modification of taking the Inoue balloon over the wire (OTW) into the left ventricle (LV). The procedure was complicated by slippage of ASD device into the right atrium, which was managed successfully by percutaneous retrieval, and deployment of a larger device. The case highlights the challenges associated with the seemingly easy transcatheter therapy for this disease entity. 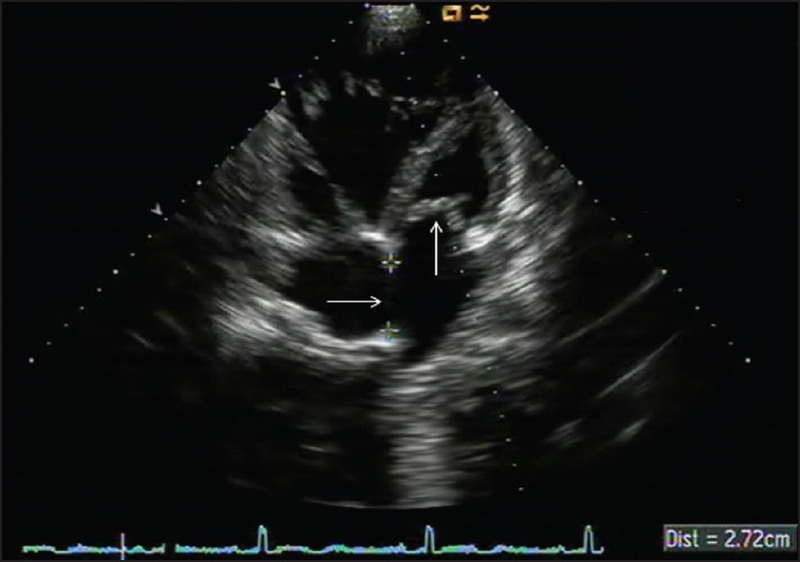 Lutembacher's syndrome, a combination of congenital defect in the atrial septum and acquired mitral stenosis (MS) with its unfavorable long-term natural history  has traditionally been corrected by surgical treatment. Due to widespread acceptance of transcatheter therapies for MS and ASD and its attendant safety, less morbidity, and cosmetic advantage, percutaneous treatment for Lutembacher's syndrome seems an attractive and feasible alternative. Although definitive percutaneous treatment has been reported in the literature, ,, none of these reports except for a recent one  have highlighted the challenges associated with simultaneous catheter-based treatment of this combination cardiac anomaly. 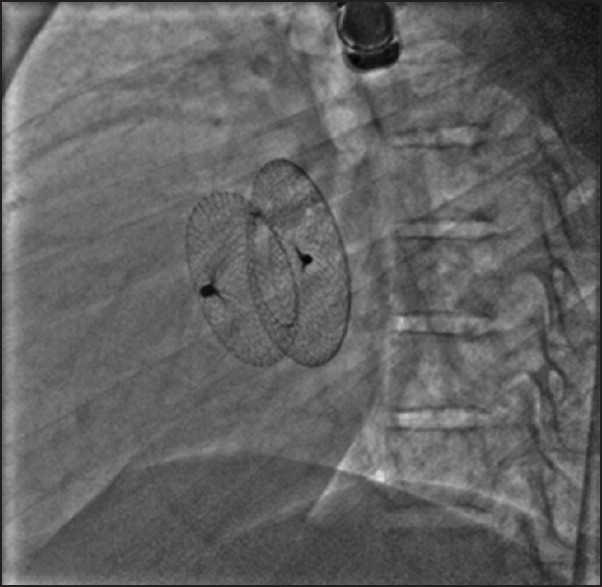 We report a case of percutaneous treatment for Lutambacher's syndrome, with the attendant technical difficulties faced in stabilizing the Inoue balloon across the mitral valve (MV) and management of post-procedure malpositioned ASD device. An 18-year-old male, presented with history of dyspnea on exertion New York Heart Association (NYHA) class II. Physical examination revealed loud first heart sound, wide and fixed split second heart sound, mid diastolic murmur at the apex, and lower left sternal border with grade 4/6 ejection systolic murmur in the left second parasternal region. Electrocardiogram (ECG) showed incomplete right bundle branch block with right atrial enlargement. Chest X-ray findings were increased pulmonary vascular markings with prominent right pulmonary artery. 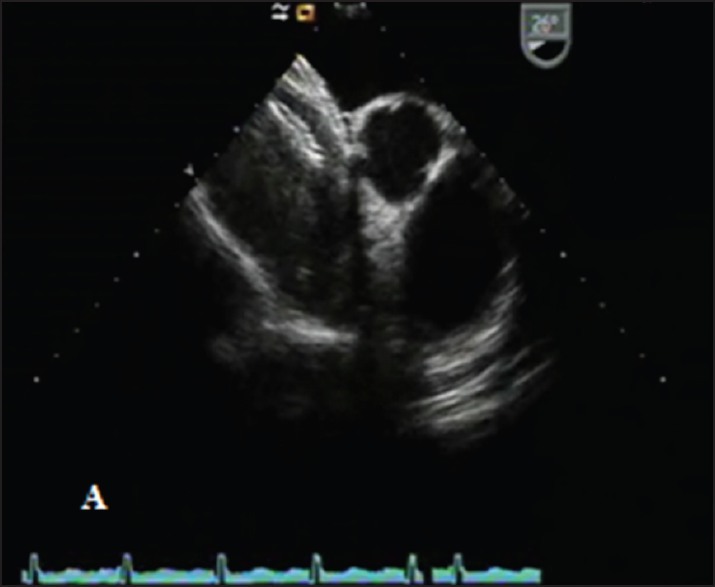 Transthoracic echocardiography (TTE) showed a 27 mm ostium secundum ASD with severe rheumatic MS [Figure 1]. The mitral valve area (MVA) was 0.67 cm 2 by planimetry. Color flow mapping revealed a left-to-right shunt across the ASD. As both the ASD and MS appeared suitable for percutaneous treatment, concurrent transcatheter therapy was planned. Patient received 300 mg of clopidogrel and 325 mg of aspirin 1 day prior to procedure. After antibiotic prophylaxis, right femoral arterial and venous access was obtained, and 5,000 units of heparin administered. Right and left heart catheterization with oximetry run confirmed a left to right shunt with step up at the atrial level with Qp/Qs of 5.37 as measured by Fick's principle. The mean left atrial pressure and transmitral gradients were relatively low, in spite of significant MS. Balloon mitral valvotomy (BMV) was first undertaken. Multiple attempts with standard Inoue technique proved futile with repeated jumping of Inoue balloon back into the right atrium (RA) and right ventricle (RV). Hence, an over -the -wire (OTW) technique was adopted with the available hardware on shelf. The mitral valve (MV) was crossed using a balloon floatation catheter (Swan Ganz) and an Inoue wire was placed directly into the LV. However, an attempt to introduce the Inoue balloon over the Inoue wire failed because of poor support. Modifying OTW technique, we recrossed the MV with a balloon floatation catheter, parking an Inoue wire directly into the left ventricle (LV). 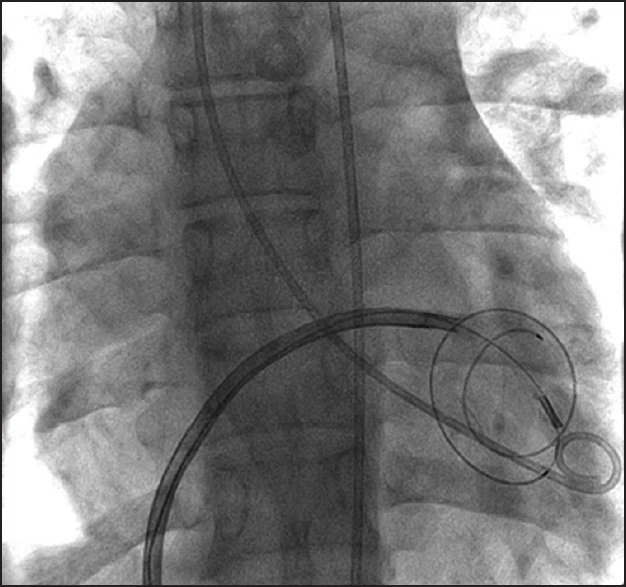 With the Inoue wire in situ, the Swan Ganz catheter was removed and a Mullins sheath was introduced into the LV. With adequate support provided by Mullins sheath, the Inoue wire was exchanged for a J tip Amplatz extra stiff wire (ESW). After removing the Mullins sheath, an Inoue balloon was successfully introduced into the LV over the ESW. With Inoue balloon stabilized in the LV cavity, the ESW was changed to Inoue wire for better conformation to the LV anatomy and provide safe support to Inoue balloon during mitral valvotomy [Figure 2]. The MV was successfully dilated using a 26 mm Inoue balloon with abolition of the transmitral gradient and a MVA of 1.8 cm 2 . After successful BMV, ASD device closure was undertaken. Based on our experience of device closure of ASDs without balloon sizing under trans-thoracic (TTE) guidance in young patients, we decided to deploy a 30 mm Amplatzer (AGA Medical, Golden Valley, MN) ASD device under TTE guidance. Postprocedure TTE showed a well-deployed device across the ASD. Twelve hours postprocedure TTE showed a malpositioned device, which was confirmed later on transesophageal echocardiography (TEE) [Figure 3]. After arranging for full surgical backup, percutaneous retrieval of malpositioned ASD device was undertaken under cinefluroscopic and TEE guidance. Intentional bevel was created at the end of a 12 French Amplatzer sheath and a 1-cm Amplatz GooseNeck snare (Amplatz, ev3 Inc., Phymouth, MN, USA) was chosen with intention to grasp the microscrew of the right atrial disk of the ASD device. 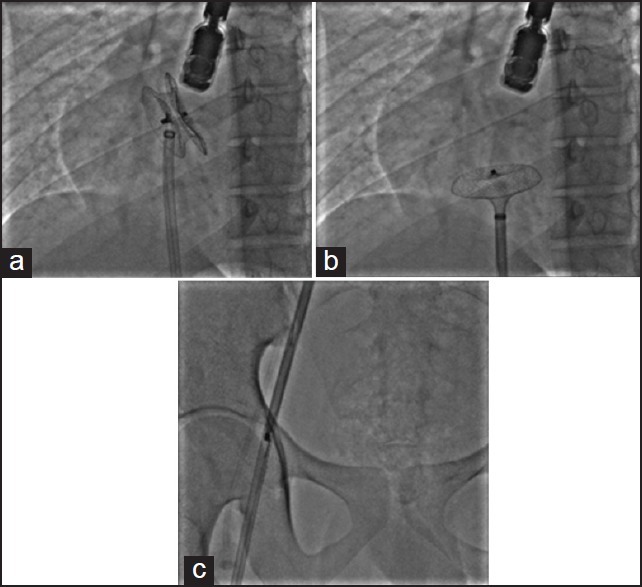 Using alternate orthogonal views to align the snare in the plane of the ASD device, the device was successfully pulled from the RA into the inferior vena cava below the kidneys and retrieved through the femoral sheath [Figure 4]a-c. Careful reassessment of ASD diameter under TEE guidance showed a procedural diameter of 30 mm and total interatrial septal length of 52 mm. Final ASD device closure [Figure 5] was done with a 36 mm Heartr™ atrial septal occluder device (Lifetech Scientific Inc., Shenzhen, China). There were no further postprocedural complications and patient has done excellently with no clinical sequelae at 16 months follow-up. Our case is interesting because we failed to cross the MV even with OTW technique. This may be related to the inadequate support provided by a small LV cavity resulting from LV underfilling consequent to significant MS augmenting the left to right shunt across the ASD with enormous RV volume overload. The OTW technique was subsequently modified in order to accomplish successful MV crossing. Though we initially crossed the MV with a balloon floatation catheter, parking an Inoue wire directly into the LV, the Swan Ganz catheter was exchanged to a Mullins sheath to provide adequate support to introduce the ESW into a small LV cavity. Once the Inoue balloon was successfully introduced into the LV over the ESW, the ESW was changed to Inoue wire for better conformation to the LV anatomy. The majority of embolizations are a function of either undersized devices or of ASDs with inadequate rims. The device malpositioning in our case seems related to undersizing as we initially deployed the device under TTE guidance which underestimated the size of the ASD. Though balloon sizing of the defect has been regarded as an integral part of transcatheter closure of ASD, there has been a recent trend towards transcatheter closure of ASDs without balloon sizing. , TTE with its advantages of not requiring general anesthesia and the convenience of presenting multiplanar views of the heart can be sufficient for the assessment of the ASDs. , In addition there is good linear correlation between TTE measurement of the defect and balloon stretched diameter. However, as reported by Li et al., TTE was most efficient in predicting device size for defects smaller than 20 mm. This surely led us to make a wrong decision regarding device sizing with its attendant catastrophe. TEE with its higher resolution is more appropriate for larger defects as the rims are usually weak, soft, and floppy; and the measurement of accurate defect diameter might be a more challenging task under TTE. However, anatomical ASD diameter, measured with TEE using edge-to-edge defect borders still tends to underestimate the device size. Hence, we utilized the procedural diameter measured using the maximal steadier rim border (thickness ≥2.5 mm) distance on TEE images as proposed by Carcagni and Presbitero  during redeployment of ASD device as it correlates well with stretched balloon diameter (SBD) in adults. Adding 4-6 mm to TEE diameter gives a good estimate of the stretched diameter in most cases,  which made us choose the final device diameter. In fact, oversizing of the device should be the rule in this condition. Though percutaneous therapy for Lutambacher's syndrome is an attractive and feasible alternative to surgery, the BMV procedure can be complex with difficulties in stabilizing the Inoue balloon across the stenosed MV. In addition a careful assessment of device size utilizing either TEE procedural diameter or conventional balloon sizing and choosing a larger device is highly recommended to prevent complications like device embolization. As this is a road less travelled, prior anticipation of the difficulties to be encountered along with a skillful approach and familiarity of operators with device retrieval techniques improve the chances of success. 1. Bashi VV, Ravikumar E, Jairaj PS, Krishnaswami S, John S. Coexistent mitral valve disease with left-to-right shunt at the atrial level: Clinical profile, hemodynamics, and surgical considerations in 67 consecutive patients. Am Heart J 1987;114:1406-14. 2. Joseph G, Abhaichand Rajpal K, Kumar KP. Definitive percutanous treatment of Lutembacher's syndrome. Catheter Cardiovasc Interv 1999;48:199-204. 3. Ledesma M, Martinez P, Cazares MA, Feldman T. Transcatheter treatment of Lutembacher syndrome: Combined balloon mitral valvuloplasty and percutaneous atrial septal defect closure. J Invasive Cardiol 2004;16:678-9. 4. Bhambhani A, Somanath HS. Percutaneous treatment of Lutembacher syndrome in a case with difficult mitral valve crossing. J Invasive Cardiol 2012;24:E54-6. 5. Meier B. Modified Inoue technique for difficult mitral balloon commissurotomy. Cathet Cardiovasc Diagn 1992;26:316-8. 6. Manjunath CN, Srinivasa KH, Patil CB, Venkatesh HV, Bhoopal TS, Dhanalakshmi C. Balloon mitral valvuloplasty: Our experience with a modified technique of crossing the mitral valve in difficult cases. Cathet Cardiovasc Diagn 1998;44:23-6. 7. Abhaichand Rajpal K, Joseph G. Re Manjunath et al. Balloon mitral valvuloplasty. Catheter Cardiovasc Interv 1999;46:117-8. 8. Levi DS, Moore JW. Embolization and retrieval of the Amplatzer septal occluder. Catheter Cardiovasc Interv 2004;61:543-7. 9. Tan CA, Levi DS, Moore JW. Embolization and transcatheter retrieval of coils and devices. Pediatr Cardiol 2005;26:267-74. 10. Amin Z, Daufors DA. Balloon sizing is not necessary for closure of secundum atrial septal defects. J Am Coll Cardiol 2005;45:317. 11. Wang JK, Tsai SK, Lin SM, Chiu SN, Lin MT, Wu MH. Transcatheter closure of atrial septal defect without balloon sizing. Catheter Cardiovasc Interv 2008;71:214-21. 12. Li GS, Kong GM, Ji QS, Li JF, Chen YG, You BA, et al. Reliability of transthoracic echocardiography in estimating the size of Amplatzer septal occluder and guiding percutaneous closure of atrial septal defects. Chin Med J 2008;121:973-6. 13. Sahin M, Ozkutlu S, Yýldýrým I, Kar agöz T, Celiker A. Transcatheter closure of atrial septal defects with transthoracic echocardiography. Cardiol Young 2011;21:204-8. 14. Rao PS, Langhough R. Relationship of echocardiographic, shunt flow, and angiographic size to the stretched diameter of the atrial septal defect. Am Heart J 1991;122:505-8. 15. Carcagni A, Presbitero P. New echocardiographic diameter for Amplatzer sizing in adult patients with secundum atrial septal defect: Preliminary results. Catheter Cardiovasc Interv 2004;62:409-14.